Crystaltech has the technical resource to detect even the most obscure glass and dishwashing issues. As the UK’s only specialist warewasher maintenance company, Crystaltech uses the latest, most reliable on-site test equipment which can detect bacteria from a specific water source. As well as the hygiene implications, the presence of high levels of bacteria in water can affect wash results, leading to problems such as flat beer from using contaminated glasses. 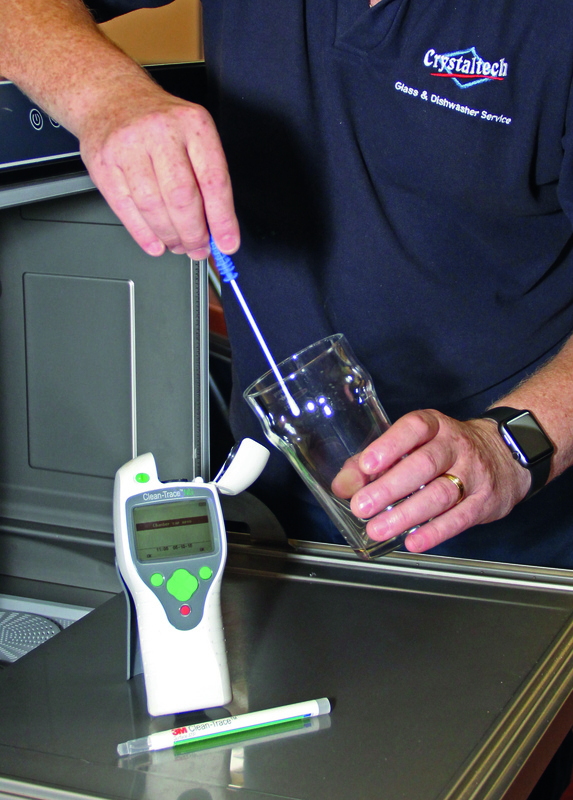 Crystaltech was called in to investigate and solve the problem of flat beer from using a glasswasher in the upstairs bar of a central London pub. The issue was more complex than many call-outs as the glasswasher in the basement bar presented good results, and the lager held its head, and yet the moment glasses were washed in the machine upstairs the beer went flat. All of the usual processes to determine the problem were carried out but pin-pointing the cause was proving difficult. Using the Rapid Hygiene testing equipment the Crystaltech engineers were able to swab the dry glasses for levels of bacteria with test results revealing no cause for concern. However, the problem of flat beer appeared to be worse the more recently that the glasses had been washed. Further 3M water quality test swabs and samples taken from the water supply to the upstairs glasswasher were found to have a high level of bacteria. This finding explained why the problem was worse immediately after the glasses had been washed. As a precaution for the customer, a test was also carried out on the water supply to the taps used for salad washing and to the ice machine as well as various other points around the pub, all of which were well within acceptable levels of contamination. One option to resolve the problem would have been to chlorinate the water system but this would have meant that the pub would have to close during the process and would lose trade. Another option was to use a Reverse Osmosis (RO) system developed by Crystaltech which not only removes minerals and salts but also bacteria. Crystaltech installed the RO system on one month’s free trial and the bacteria levels were significantly reduced from 236RLU to 3RLU (150 is the maximum acceptable limit). The effect was an immediate resolution to the problem of flat beer, chemical usage was reduced by 70% – enabling lower wash temperatures, and the cleanliness of the glasses is now, near perfect.